Marian Goodman Gallery is pleased to announce an exhibition of Maria Nordman’s FILMROOM EAT, 1967 – PRESENT and two Standing Pictures, which will open on June 24th and will be on view through Friday, July 31st. Nordman will also enact THE WHISPER in Central Park with ‘persons met by chance’, continuing a work that started several decades ago in different public spaces in cities all over the world. The work will be enacted spontaneously during the course of the exhibition. This will be the artist’s second exhibition at the gallery and follows the presentation of the companion piece FILMROOM SMOKE 1967-PRESENT at the Los Angeles County Museum of Art in 2011-2012, where YANG NA 2011-PRESENT, a third conjunct work is currently on view. Maria Nordman is known as one of the most significant and visionary artists to emerge from California in the 1960s and 70s. FILMROOM EAT is her first work to use people as actors and participants and uses site, time and place with any two persons who arrive by chance. Filmed at noon with ‘two chosen actors at a table who decide from instant to instant how they wish to take in a meal presented to them,’ the work was shot synchronously with two cameras, one static with a fixed focus, the other hand-held, reacting to the motions of the actors, who thereby become directors of the film. The inversion of acting and directing produces two films projected side by side, but separated by a short wall creating a three-room proscenium, which enables viewers, or participants to be active agents in the room, changing their position in space in order to construct their own narrative. Nordman requests that the FILMROOMS are entered by two persons at a time, connecting with the two initial actors. As Ann Rorimer states in “New Art in the 60s and 70s Redefining Reality”, FILMROOM EAT sets ‘a precedent for works that avoid static representation and include the observer in the process of giving meaning to the work’. 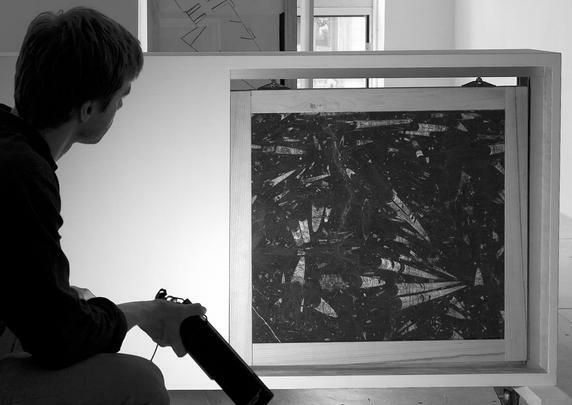 The presence of the filmed table in the space – historically, one of the first instances in which a filmed prop appears in the projection room – further blurs the boundaries between past and present, film and sculpture, action and architecture. Following FILMROOM EAT and the nearly contemporary FILMROOM SMOKE, Nordman transforms her work process from the recorded image to constructing a series of open rooms in different cities which extend the co-authorial role to anyone, or, in her terminology, to ‘any person arriving by chance’. These rooms are subtle experiences with contextual elements of the city and the light of the sun. In fact, the sun – and nature – together with the life of the neighborhood become the ‘co-actors’ in the artist’s subsequent work, as in her seminal Untitled 1990 – present Day & Night – 14 Continuous Turns of the Earth, a double room at the entrance to Central Park in New York. Another double room is permanently present in Varese, Italy, in the collection of the Fondo Ambientale d’Italia. The extension of place also occurs in the Standing Pictures, two of which will be on view in the exhibition. These standing drawings are activated by being pulled into the light of the sun and only exist during the time in which a person is present. The Standing Pictures, as the open rooms, enact inter-generational meetings and occur in different cities and different countries around the world. Maria Nordman’s focus on direct experience and the ‘co-authorial role’ she ascribes to visitors to her works foreshadows practices of artists who emerged in the 1990’s. Her avoidance of catalogues from 1967-87 and her focus on a ‘living catalogue held in personal memory’ also finds resonance in the work of Tino Sehgal. Maria Nordman’s solo exhibitions, which are often accompanied by projects in the city include: Standing Pictures and Inter-performances, Staatliche Kunstsammlungen Dresden, Germany (2014), Geo-Aesthetics, SMAK Stedelijk Museum voor Actuele Kunst, Ghent, Belgium (2013), Yang Na 2011- PRESENT, Los Angeles County Museum of Art, Los Angeles (2011-12), Proto-Spective Serralves Foundation, Porto, Portugal (2007), Untitled 1990-PRESENT, MAMCO, Geneva, Switzerland, (2009), La Primavera/Le Printemps, UNESCO Zeche Zollverein, Essen, Germany (2009), and at Dia Art Foundation and in Central Park New York (1990-91). She participated in Documentas 6, 7, 8 (1977, 1982, 1987) and was included twice in Skulptur.Projekte Münster in Germany (1997, 1987). Earlier this year, three of her Standing Pictures & The Whisper were included in Event Sculpture at the Henry Moore Institute in Leeds. Please join us at the opening reception for the artist on Wednesday, June 24th, from 6-8 pm.